Record for Online or Offline, Master or Backup. 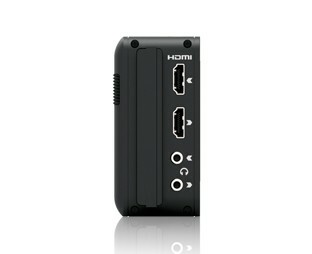 Up to 10-Bit 4:2:2, 220Mbs on to 2.5" HDD or SSD interchangeable media. Record and Monitor from any HDMI source including DSLR cameras, Decks, Switchers, PC/Mac, iPad and iPhone. Playout to a wide range of devices including monitors and projectors. Ready-to-Edit visually loss-less recordings on commodity HDD or SSD media. No more expensive and low-capacity memory cards required! High-Resolution 800x480 screen results in over 216 pixels per inch on the 4:3" display and is viewable at 170°. Monitoring in AtomOS 3.0 provides Focus Peaking, Zebra, False Colour, Blue Only Exposure and supports loop playback. Pristine full-resolution playback and playout with full transport controls and SmartLog.